The military history of the United States in World War II covers the war against Germany, Italy, and Japan, starting with the 7 December 1941 attack on Pearl Harbor. 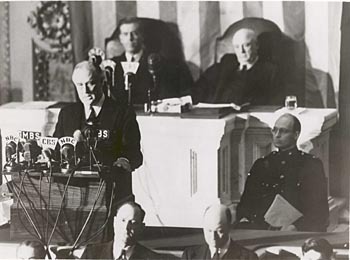 During the first two years of World War II, the United States had maintained formal neutrality as made official in the Quarantine Speech delivered by U.S. President Franklin D. Roosevelt in 1937, while supplying Britain, the Soviet Union, and China with war material through the Lend-Lease Act which was signed into law on 11 March 1941, as well as deploying the U.S. military to replace the British invasion forces in Iceland. Following the "Greer incident" Roosevelt publicly confirmed the "shoot on sight" order on 11 September 1941, effectively declaring naval war on Germany and Italy in the Battle of the Atlantic. 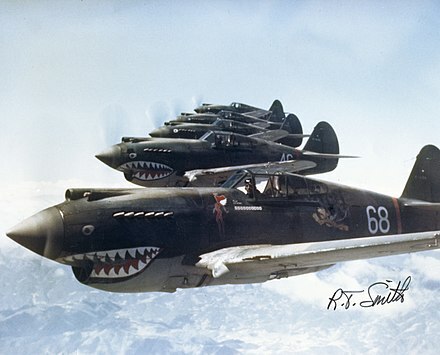 In the Pacific Theater, there was unofficial early U.S. combat activity such as the Flying Tigers. During the war, over 16 million Americans served in the United States Armed Forces, with 405,399 killed in action and 671,278 wounded. There were also 130,201 American prisoners of war, of whom 116,129 returned home after the war. 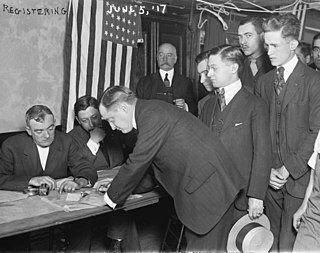 Key civilian advisors to President Roosevelt included Secretary of War Henry L. Stimson, who mobilized the nation's industries and induction centers to supply the Army, commanded by General George Marshall and the Army Air Forces under General Hap Arnold. The Navy, led by Secretary of the Navy Frank Knox and Admiral Ernest King, proved more autonomous. Overall priorities were set by Roosevelt and the Joint Chiefs of Staff, chaired by William Leahy. Highest priority went to the defeat of Germany in Europe, but first the war against Japan in the Pacific was more urgent after the sinking of the main battleship fleet at Pearl Harbor. Wounded in action (WIA) describes combatants who have been wounded while fighting in a combat zone during wartime, but have not been killed. Typically it implies that they are temporarily or permanently incapable of bearing arms or continuing to fight. During the Second World War (1939–1945), "Arsenal of Democracy" was the slogan used by U.S. President Franklin D. Roosevelt, in a radio broadcast delivered on 29 December 1940. 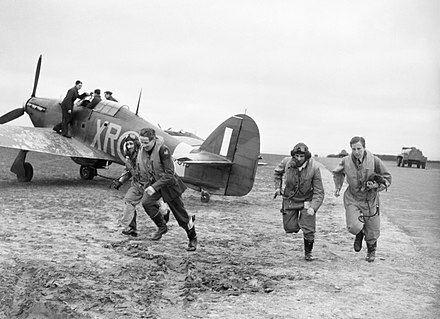 Roosevelt promised to help the United Kingdom fight Nazi Germany by giving them military supplies while the United States stayed out of the actual fighting. The president announced that intent a year before the Attack on Pearl Harbor, at a time when Germany had occupied much of Europe and threatened Britain. As the war progressed Marshall became the dominant voice in the JCS in the shaping of strategy. When dealing with Europe, the Joint Chiefs met with their British counterparts and formed the Combined Chiefs of Staff. Unlike the political leaders of the other major powers, Roosevelt rarely overrode his military advisors. The civilians handled the draft and procurement of men and equipment, but no civilians—not even the secretaries of War or Navy, had a voice in strategy. Roosevelt avoided the State Department and conducted high level diplomacy through his aides, especially Harry Hopkins. Since Hopkins also controlled $50 billion in Lend Lease funds given to the Allies, they paid attention to him. On 16 June 1941, after negotiation with Churchill, Roosevelt ordered the United States occupation of Iceland to replace the British invasion forces. On 22 June 1941, the US Navy sent Task Force 19 (TF 19) from Charleston, South Carolina to assemble at Argentia, Newfoundland. 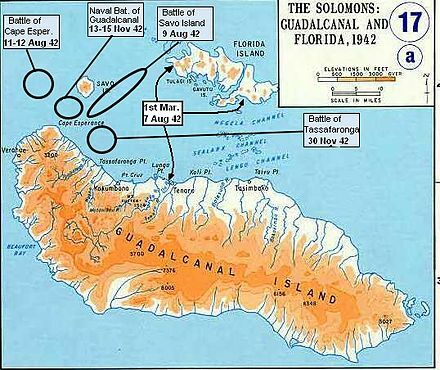 TF 19 included 25 warships and the 1st Provisional Marine Brigade of 194 officers and 3714 men from San Diego, California under the command of Brigadier General John Marston. Task Force 19 (TF 19) sailed from Argentia on 1 July. On 7 July, Britain persuaded the Althing to approve an American occupation force under a U.S.-Icelandic defense agreement, and TF 19 anchored off Reykjavík that evening. U.S. Marines commenced landing on 8 July, and disembarkation was completed on 12 July. On 6 August, the U.S. Navy established an air base at Reykjavík with the arrival of Patrol Squadron VP-73 PBY Catalinas and VP-74 PBM Mariners. U.S. Army personnel began arriving in Iceland in August, and the Marines had been transferred to the Pacific by March 1942. 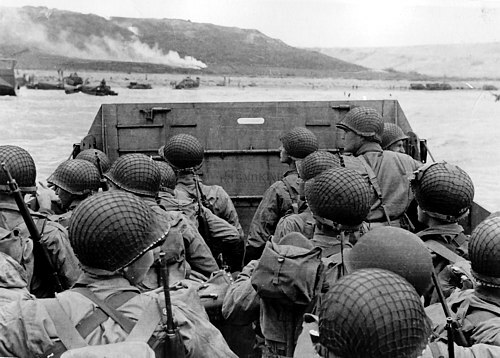 Up to 40,000 U.S. military personnel were stationed on the island, outnumbering adult Icelandic men (at the time, Iceland had a population of about 120,000.) The agreement was for the US military to remain until the end of the war (although the US military presence in Iceland remained through 2006, as postwar Iceland became a member of NATO). 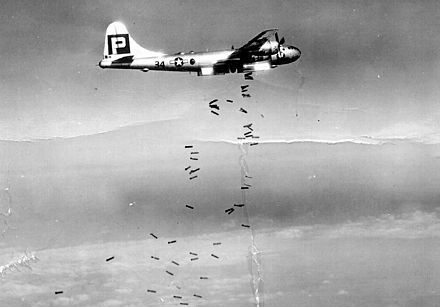 The United States did not have a smooth entry into the war against Nazi Germany. 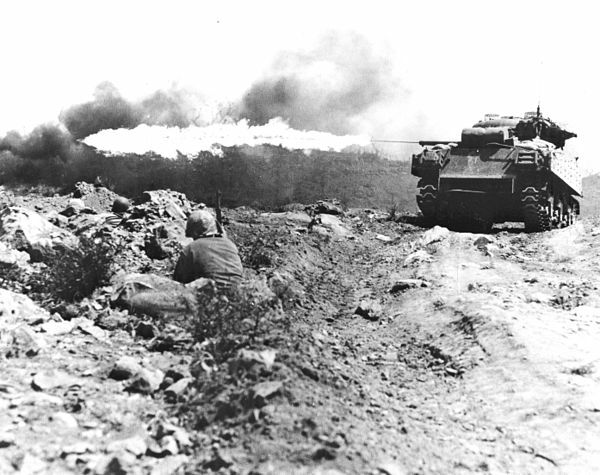 Early in 1943, the U.S. Army suffered a near-disastrous defeat at the Battle of the Kasserine Pass in February. 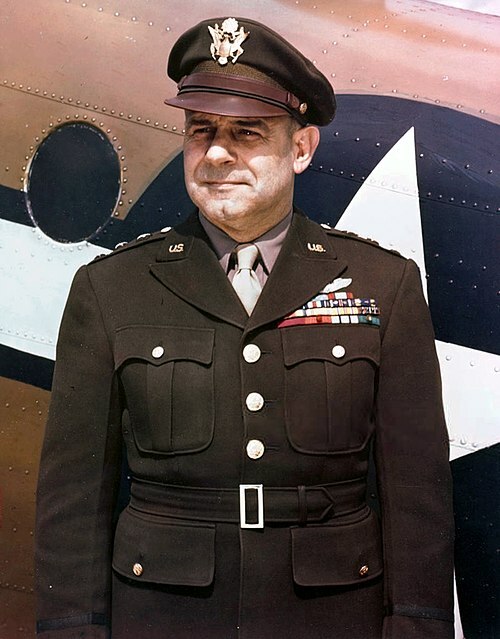 The senior Allied leadership was primarily to blame for the loss as internal bickering between American General Lloyd Fredendall and the British led to mistrust and little communication, causing inadequate troop placements. 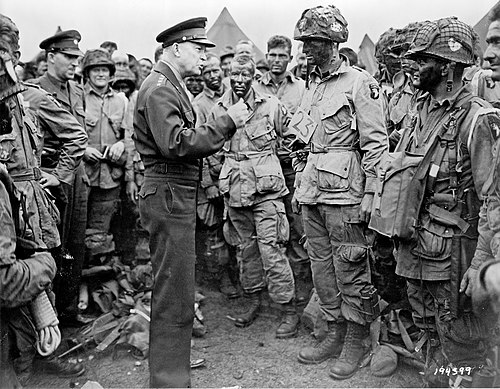 The defeat could be considered a major turning point, however, because General Eisenhower replaced Fredendall with General Patton. On 16 December 1944, the Germans launched a massive attack westward in the Ardennes forest, along a battlefront extending southwards from Monschau to Echternach, hoping to punch a hole in the Allied lines and capture the Belgian city of Antwerp. The Allies responded slowly, allowing the German attack to create a large "bulge" in the Allied lines. 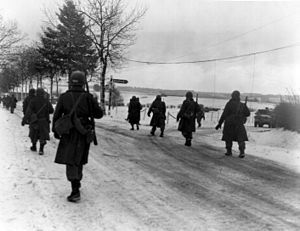 In the initial stages of the offensive, American POW s from the 285th Field Artillery Observation Battalion were executed at the Malmedy massacre by Nazi SS and Fallschirmjäger. 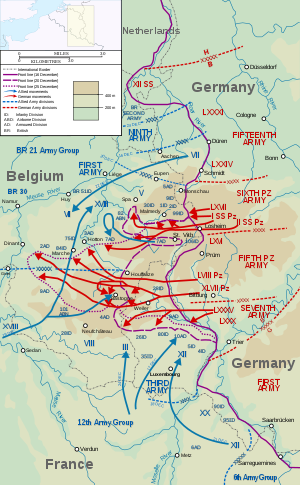 The South German Offensive is the general name of one of the final offensives of World War II in Europe. 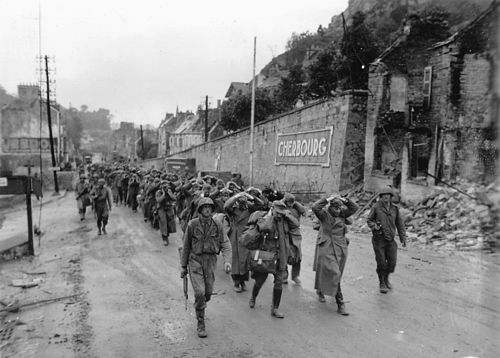 The offensive was led by the Seventh and Third armies of the United States along with the First Army of France. 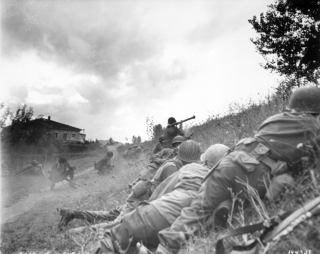 Soviet troops linked up with American forces in Czechoslovakia notably in the Battle of Slivice. [ citation needed ] The offensive was made by the US 6th Army Group to protect the 12th Army Group's right flank and to prevent a German last stand in the Alps. However German resistance was much more fierce than in the north, which slowed the 6th Army Group's progress. However, by the end of April, many German divisions surrendered without a fight to the advancing American forces to avoid the inevitable destruction. 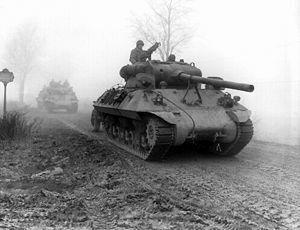 The VI Corps of the Seventh Army linked up with the US Fifth Army, which fought through Italy, in the Alps as the Third Army advanced into Austria and Czechoslovakia, where it linked up with Soviet forces advancing from the east. Fighting continued a few days after the Surrender of Germany on 8 May, due to German forces fighting west to surrender to the Americans instead of the Soviets. 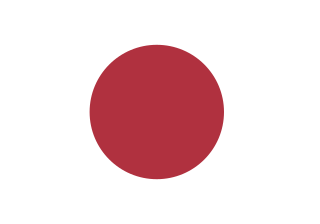 Having learned important lessons at Coral Sea, the United States Navy was prepared when the Japanese navy under Admiral Isoroku Yamamoto launched an offensive aimed at destroying the American Pacific Fleet at Midway Island. The Japanese hoped to embarrass the Americans after the humiliation of the Doolittle Raid on Tokyo. Midway was a strategic island that both sides wished to use as an air base. 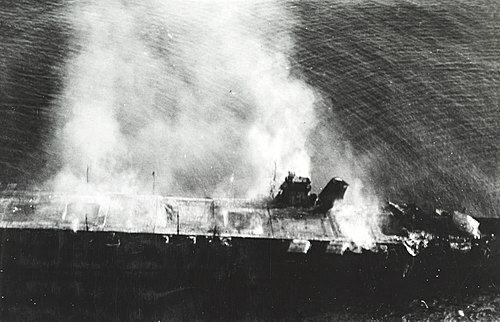 Yamamoto hoped to achieve complete surprise and a quick capture of the island, followed by a decisive carrier battle with which he could completely destroy the American carrier fleet. Before the battle began, however, American intelligence intercepted his plan, allowing Admiral Chester Nimitz to formulate an effective defensive ambush of the Japanese fleet. 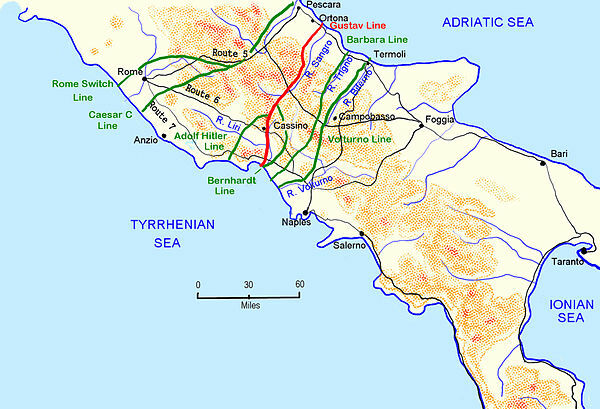 The battle began on 4 June 1942. By the time it was over, the Japanese had lost four carriers, as opposed to one American carrier lost. 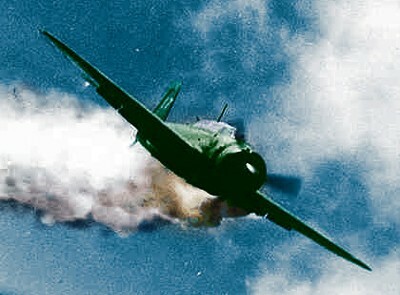 The Battle of Midway was the turning point of the war in the Pacific because the United States had seized the initiative and was on the offensive for the remaining duration of the war. Following the resounding victory at Midway, the United States began a major land offensive. 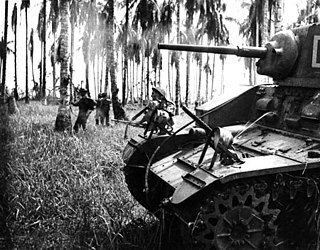 The Allies came up with a strategy known as Island hopping, or the bypassing of islands that either served little or no strategic importance  or were heavily defended but could be bypassed, such as Rabaul. 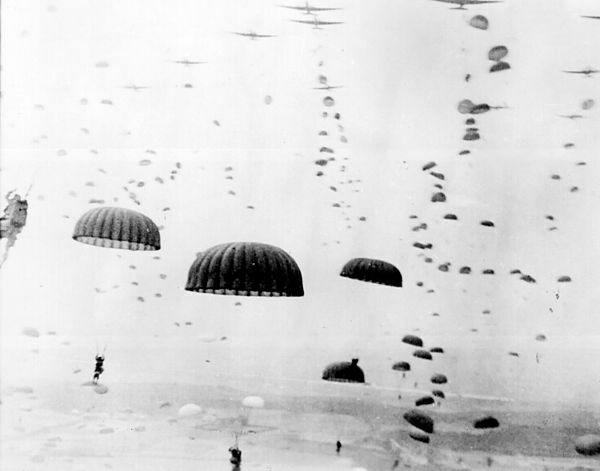 Because air power was crucial to any operation, only islands that could support airstrips were targeted by the Allies. 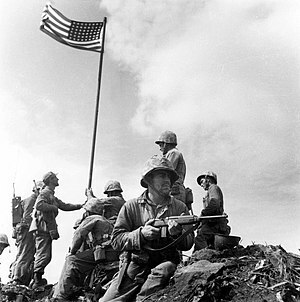 The fighting for each island in the Pacific Theater would be savage, as the Americans faced a determined and battle-hardened enemy who had known little defeat on the ground. 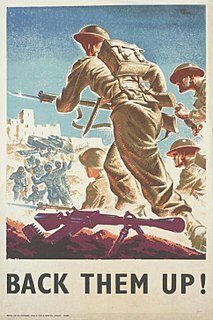 Wikimedia Commons has media related to World War II . 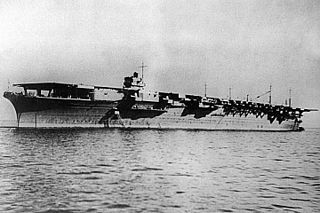 Zuikaku was a Shōkaku-class aircraft carrier of the Imperial Japanese Navy. Her complement of aircraft took part in the attack on Pearl Harbor that formally brought the United States into the Pacific War, and she fought in several of the most important naval battles of the war, before being sunk during the Battle of Leyte Gulf. 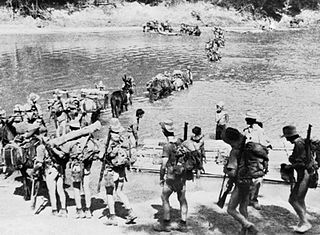 The Battle of Noemfoor was a battle of World War II that took place on the island of Noemfoor, in Dutch New Guinea, between 2 July and 31 August 1944. United States and Australian forces attacked to capture Japanese bases on the island. 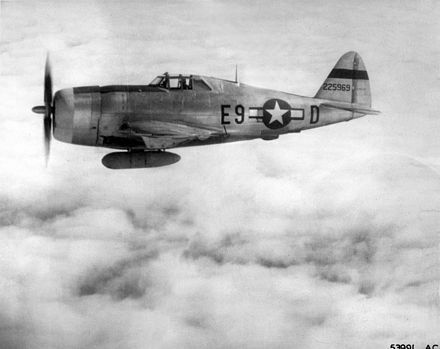 The air warfare of World War II was a major component in all theaters and, together with anti-aircraft warfare, consumed a large fraction of the industrial output of the major powers. 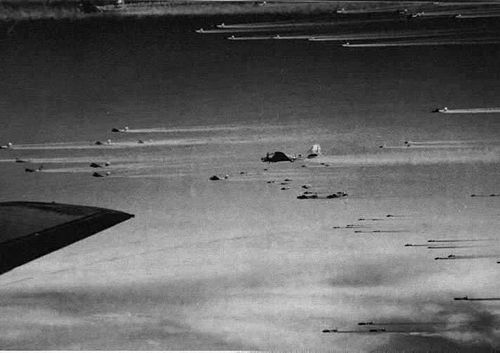 Germany and Japan depended on air forces that were closely integrated with land and naval forces; the Axis powers downplayed the advantage of fleets of strategic bombers, and were late in appreciating the need to defend against Allied strategic bombing. 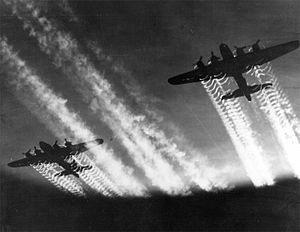 By contrast, Britain and the United States took an approach that greatly emphasised strategic bombing, and tactical control of the battlefield by air, as well as adequate air defences. Both Britain and the U.S. built a strategic force of large, long-range bombers that could carry the air war to the enemy's homeland. 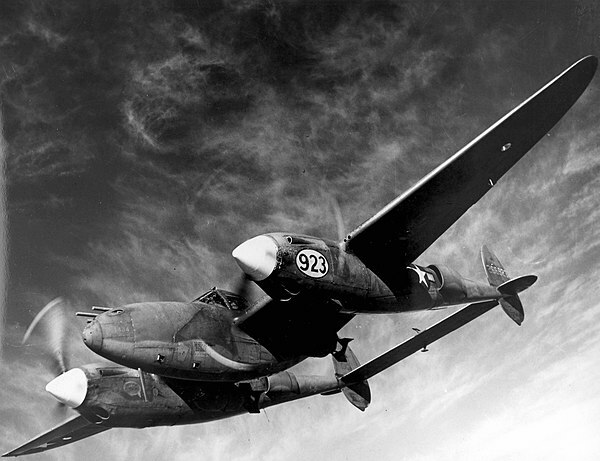 Simultaneously, they built tactical air forces that could win air superiority over the battlefields, thereby giving vital assistance to ground troops. 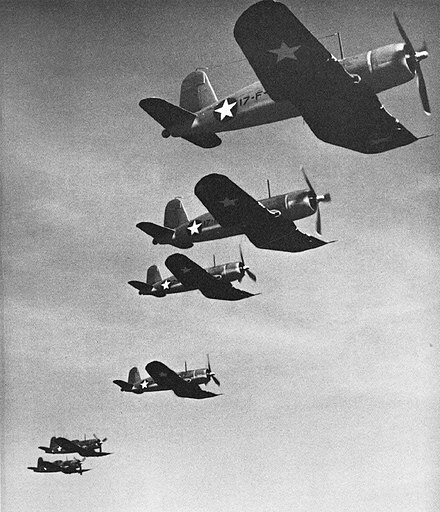 The U.S. and Royal Navy also built a powerful naval-air component based on aircraft carriers, as did Japan; these played the central role in the war at sea. ↑ "World War 2 Casualties". World War 2. Otherground, LLC and World-War-2.info. 2003. Retrieved 20 June 2006. ↑ Robert Dallek, Franklin D. Roosevelt and American Foreign Policy, 1932–1945 (1995). 1 2 3 "Eagle Squadrons" . Retrieved 19 April 2015. 1 2 Ford 1991, pp. 30–34. 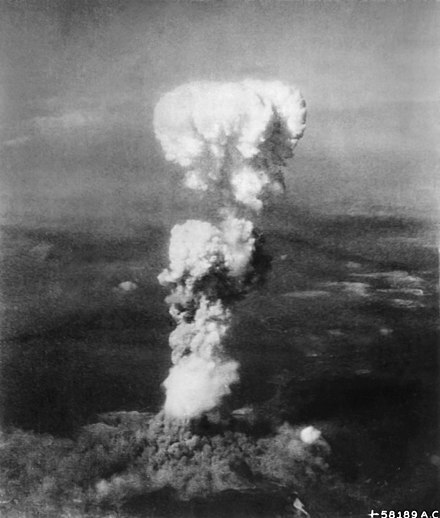 ↑ Secretary of War Henry Stimson, however, did control decisions about building and using the atomic bomb. 1 2 Morison, Samuel Eliot (1975). 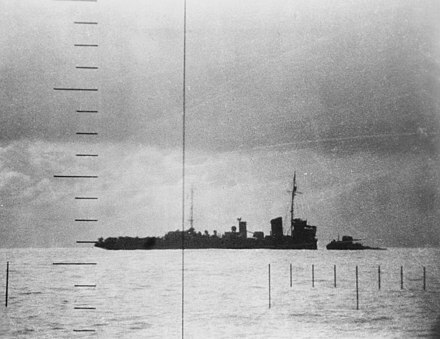 The Battle of the Atlantic September 1939 – May 1943. Little, Brown and Company. pp. 74–79. ↑ "World War II". Historynet.com. Retrieved 13 January 2015. ↑ Peter Grier (7 December 2011). 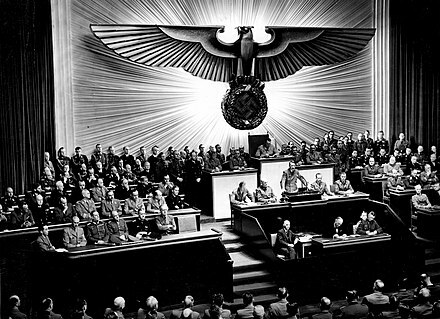 "Pearl Harbor Day: How did Adolf Hitler react to the attack?". The Christian Science Monitor. csmonitor.com. Retrieved 9 September 2012. 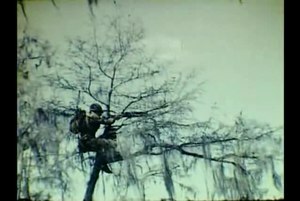 ↑ "Pacific Theater, World War II — Island Hopping, 1942–1945", USHistory.com. ↑ "World War 2 Submarines". ↑ Roscoe, Theodore. Pig Boats (Bantam Books, 1958); Blair, Silent Victory, pp.991–2. 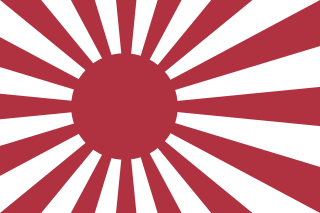 ↑ RD Designs (7 December 1941). "Sinkings By Boat". Pigboats.com. Retrieved 31 October 2010. 1 2 Blair, Clay, Jr. Silent Victory (New York, 1976), p.878. 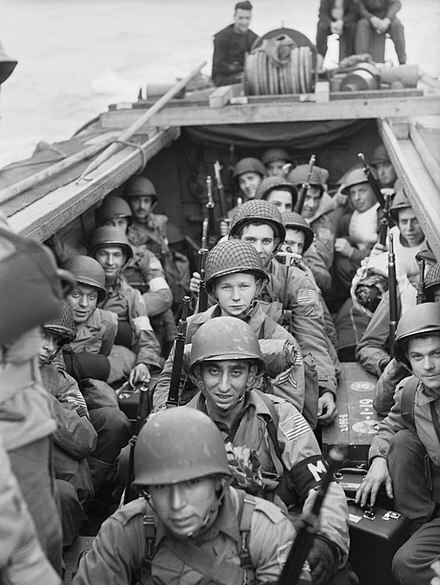 Wikimedia Commons has media related to United States in World War II .